Join the warm and welcoming Brettermeier family, the superior Theresia mixes contemporary with traditional styles, and is the only hotel in Saalbach/Hinterglemm that specialises in sustainable and organic produce. Our regular guests appreciate the wide choice of food and excellent leisure facilities here. Offering award-winning cuisine (2 Gault Millau toques) this hotel has a reputation for excellence. Non smoking policy applies to the entire hotel. All rooms are non-smoking and have bath, balcony, cable, TV, safe, telephone, radio, minibar, (Free non-alcoholic drinks), hairdryer, bathrobes, slippers and Free Wi-Fi internet access. 'Bernkogel' Austrian twins have seating area and north-west facing balcony and are available for single use. Spacious 'Zwölferkogel' rooms have lounge area and south-east facing balcony. Even larger 'Reiterkogel' rooms have lounge area, west-facing balcony, and garden view and both rooms can sleep up to 4. All special diets catered for. Together with Saalbach, Hinterglemm’s closely connected neighbour, and nearby Fieberbrunn, and Leogang, Hinterglemm forms one of Europe’s most exciting ski circuses. With 270km of excellent runs, this attractive Tirolean village at the end of the Glemm Valley is a piste-basher’s dream destination. The wide, snow sure nursery slops in Hinterglemm make this the best resort in the ski circus for complete beginners. And the wider area offers some excellent blue runs, perfect for those progressing onto the pistes. On powder days Hinterglemm is renowned for its excellent off-piste, making it a fantastic destination for dedicated freeriders. Largely south-facing, the slopes of Hinterglemm are perfectly placed for capturing the sun and enjoying the absolutely outstanding scenery. Less flashy than its neighbour, Hinterglemm is a more relaxed destination than Saalbach and has a family friendly atmosphere. The resort still knows how to party and the afternoons and après bars, such as the mountainside Goaßstall, can get very lively. 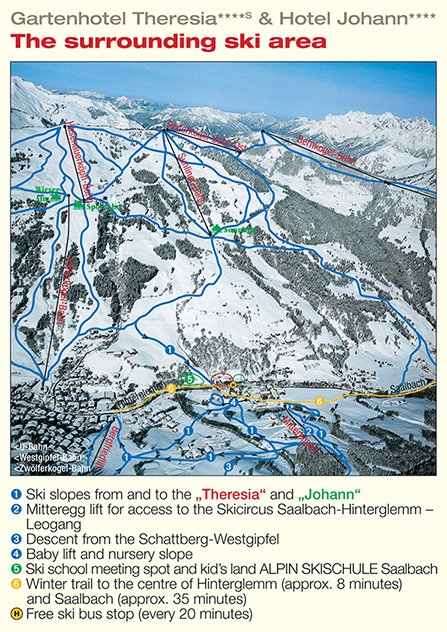 There are a wealth of restaurants across Saalbach and Hinterglemm and beyond. The majority of restaurants in Hinterglemm focus on traditional Austrian cuisine but you will also find Italian trattorias serving pizza and hotel restaurants serving burgers and steak. When we’re on the mountain we head to the Bergstadl. Near the base of the Westgipfelbahn and just off the piste, this traditional Austrian stube serves scrumptious regional cusine. Our favourite is the Wiener schnitzel. We generally think of the goat themed Goaßstall as an après ski destination, but we have to admit that it has an incredible menu too. The platters look amazing, especially the Hoaße Goaß – a huge fillet steak. In the village, the popular Thomsn Rock café and restaurant serves pizza, steak and burgers. The terrace of this funky, modern restaurant is a fantastic location to enjoy a burger – especially on a warm bluebird day. The quieter cousin of its livelier neighbour, Hinterglemm has a more relaxed après ski scene than Saalbach. Yet skiers and snowboarders that enjoy a good àpres scene are still well served and bars such as the rustic, thriving Goaßstall rank amongst the best in the Alps. The popular and après award-winning Tanzhimmel is our favourite spot in the village to go dancing. This bar and disco is in the heart of the village and the outdoor area is just as great as it is inside. Open late into the evening, the Glemmerkeller at the Hotel Glemmtallerhof is a fantastic place to unwind with a glass of wine at the end of the day. With live music every day, the Glemmerkeller is surprisingly lively given its traditional, chilled setting. There are a handful of ski equipment and sports rental shops in the village centre as well as places selling local products and souvenirs. Visitors should not expect to find a large variety of shops but will not struggle to find basic supplies. There are many hotels offering incredible, state of the art spas and wellness facilities across Hinterglemm. Both the Gardenhotel Theresia and the Hotel Alpine Palace provide stunning indoor and outdoor pools. The heated pool at the Gardenhotel Theresia even uses specialist mineral water that soothes the skin. The Alpinresort Sport and Spa has an extensive wellness and leisure area with indoor and outdoor pools, whirlpools and a range of saunas and steam rooms. The Alpinresort is a fantastic place to relax and beauty treatments and massages are available locally. Finally, the Hotel Glemmtallerhof also has leisure area with an indoor pool, sauna, steam room and a gym. It has to be said that Hinterglemm is a fantastic resort to combine a ski and spa holiday! The Saalbach and Hinterglemm area enjoys a good party and it’s therefore unsurprising that there is such a vibrant calendar of events taking place throughout the winter. BERGFESTival kicks off the winter season in early December with two nights of “Rock and Rodeln”. Live music performances take place across the resort – both on and off the mountain. In mid-December the Rave on Snow festival brings electronic music to the slopes of Saalbach and Hinterglemm. The festival, now over 20 years old, attracts big names from across the world of underground house and techno music. Hinterglemm celebrates the end of the season in style with Dutchweek – a series of snow parties and skiing events, all with a Dutch twist. And the Whitepearl Mountain Days celebrates spring skiing with fine food and music. Finally, it’s well worth heading over to Fieberbrunn for the Freeride World Tour. The event features the world’s best freeriding skiers and boarders tackling some of the most dramatic lines on the mountain. It’s an insane visual spectacle. * Does not include boots. L (15-21 Dec & 16 Mar - end of the season), H (All other dates). All Saver Packs must be pre-booked in the UK and are not bookable locally. L (15-21 Dec & 16 Mar - end of the season), H (All other dates). Children born from 2013 - free. Location Ski to the door using a T-bar across the road from the hotel which connects with the main lifts. The village centre and gondola are 400m from the hotel and the ski bus stops outside. The Kids' practice area is beside the hotel.